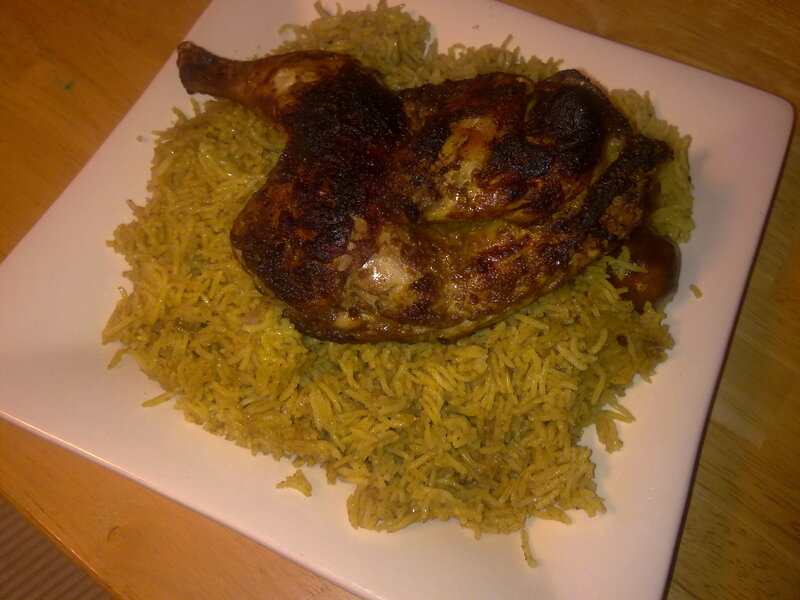 My husband Khaled cooks for me once a year. The very first time he made this Kabsah [it’s the only thing he really makes besides steak] I was blown away with its deliciousness. 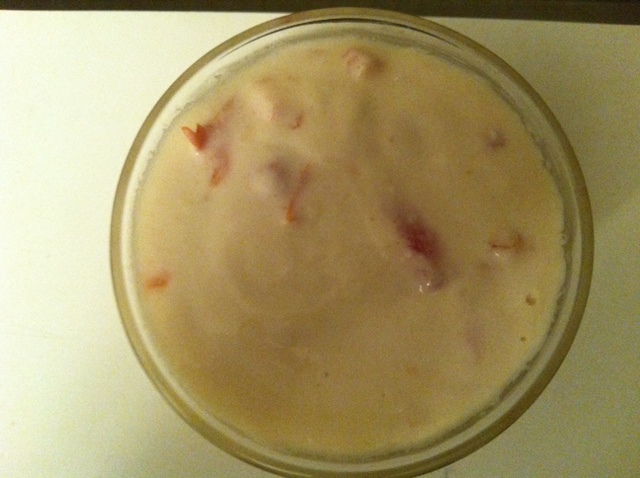 It is quick, easy and does not sacrifice taste. When I am crunched for time, this is what I usually make. I asked him where he learnt this and he told at the Yemeni Bachelor pad he stayed in before we got married. He added, “We made it every day! Different person every day but the same recipe.” What makes it convenient is that you can use any spice mix for this, but Hawayej Shirkah [mixture of ground cumin, coriander, cinnamon, cardamon, pepper, and sometimes turmeric] is the one typically used by Yemenis for this one. I am sure before Yemeni brothers migrate from Yemen their mothers, sisters or wives send them with a big bag of this mixed spice. 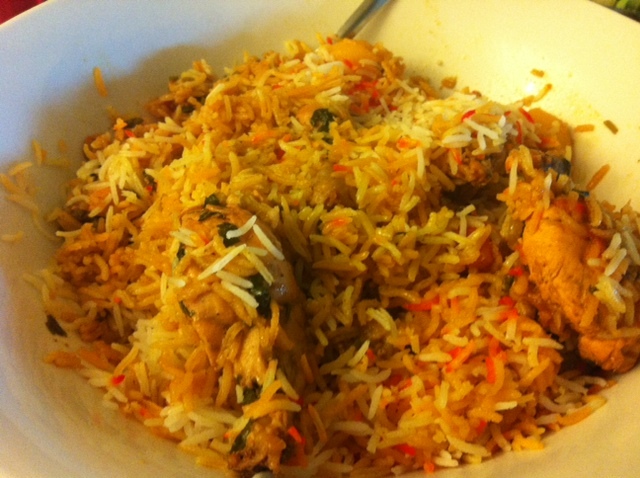 But you can use any spice mix–Garam Masala or even Biryani mixes work equally well. They usually use one pot that they can start on the stove and then place in the oven. 1) 1 chicken or 1 lb of lamb cut into medium pieces. If you are using lamb then boil it until it is well done. Alright let’s begin! 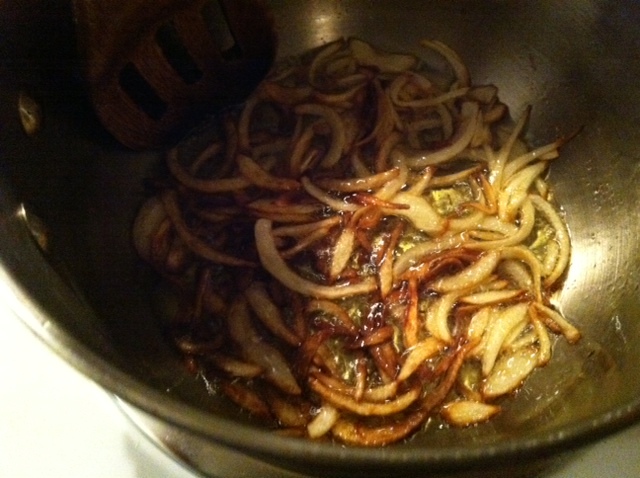 In the pot, under medium high heat, add the onion slices and let brown a little. 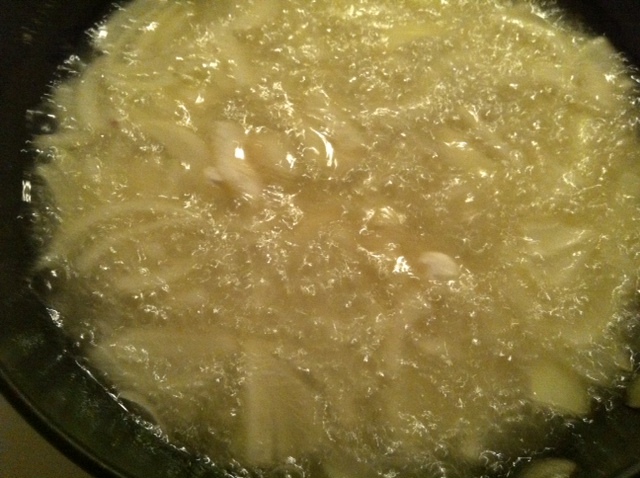 Then add the oil and potatoes. 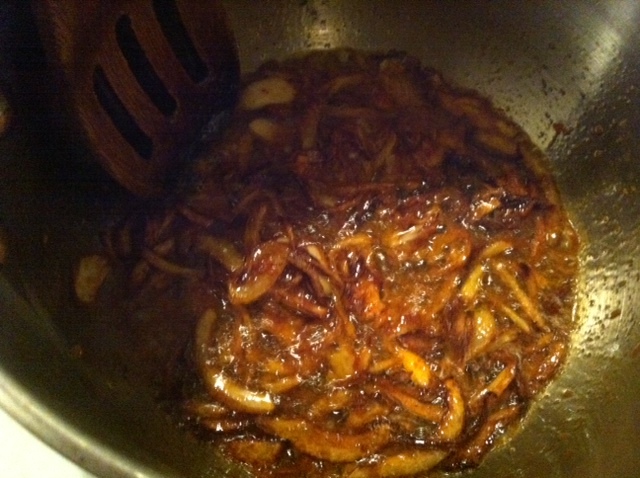 When the onion has browned, add the meat, garlic, spice, tomatoes, green chilly, and cilantro. 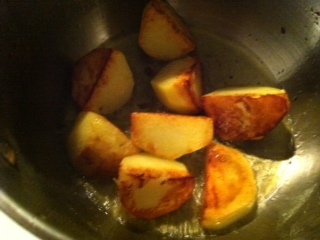 Let cook for 5 minutes and then add 1 cup of water and let cook until the potato is almost done [but not quite]. 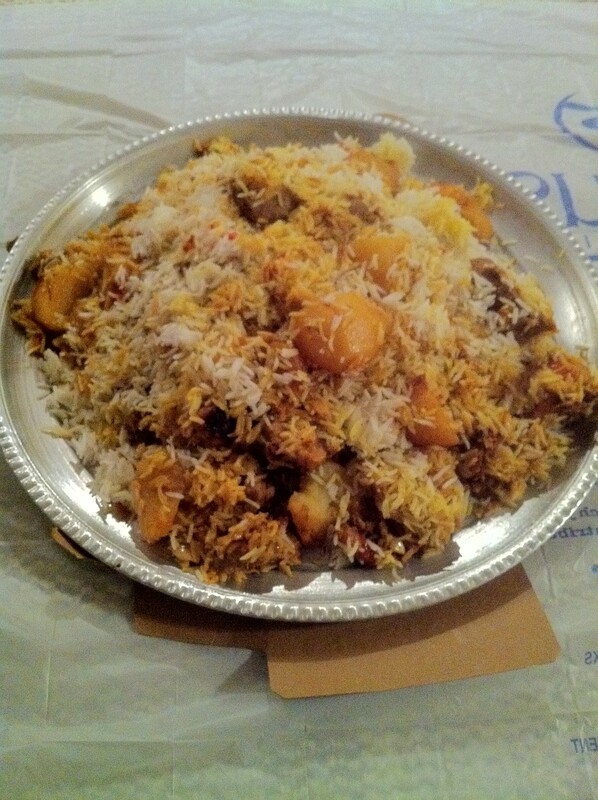 Layer all the rice on top. Sprinkle a little of the food coloring and about 2 tbslp of water and place in oven for 20-30 minutes at 350 degrees Fahrenheit. It’s done. Serve hot with your favorite salad. 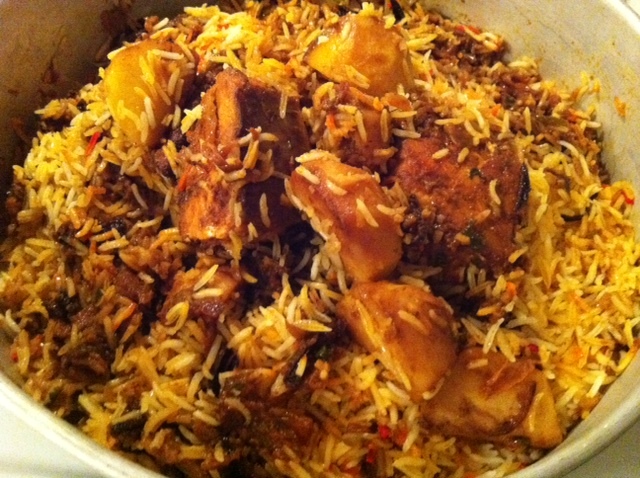 If you are married to an Arab man from a region where rice is eaten often [almost daily basis], making rice can be a dilemma if every day is a surprise ranging from perfect to reactions such as, “Is this rice or Aseeda!” This rice recipe will help overcome those days when your rice is mistaken for Aseeda. No more surprises from now on, rather consistency. So pay attention! Preheat oven to 350 degrees fahrenheit. Bring water to a rolling boil. Add salt [make sure it’s enough, since this is the only time you will be salting the rice], cardamon, peppercorns, cinnamon sticks and let boil for a minute or so. We want the water to acquire the flavor and scent of these spices. Add the rice and let boil until almost done–‘almost done’ means that when you bite into it you feel it needs about a minute or two to be completely cooked through. Turn off and drain water. In the same pot [if oven proof/if not then use a casserole dish] add one tblsp of olive oil to the bottom , add the rice, sprinkle about 2 tblsp of water onto the rice, and the rest of the olive oil. 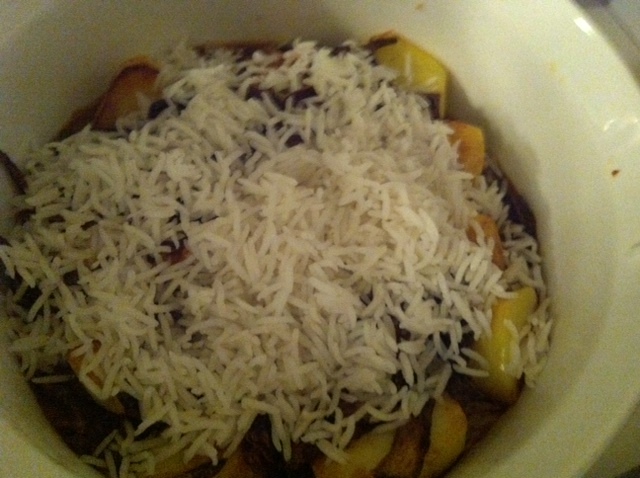 Cover and place in oven for 20 minutes. 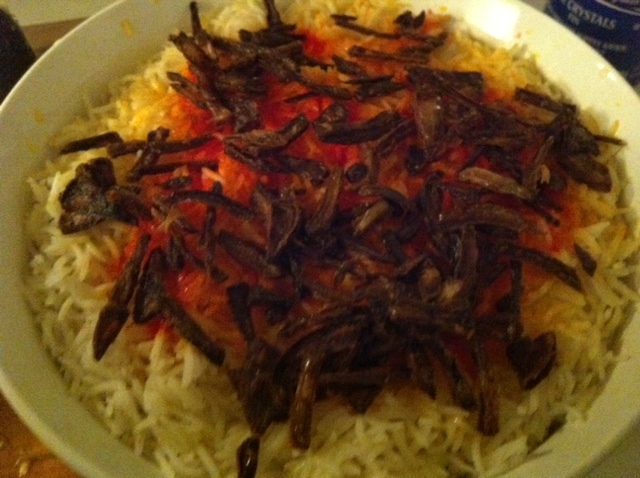 The finished product as they say in Aden comes out, “With each rice on bad terms with its neighbor” :) which means that it comes out restaurant style. 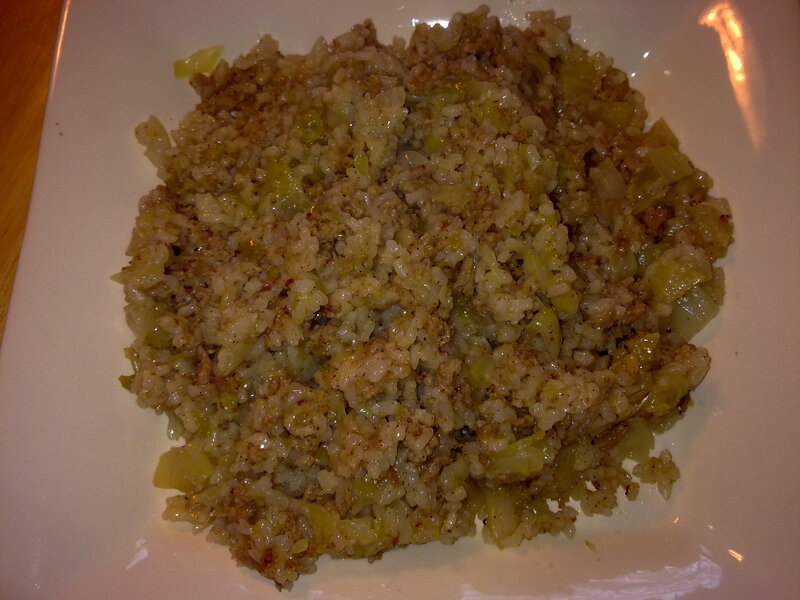 This is a very quick meal to make, unbelievably delicious, and healthy. Can’t say that about a lot of meals for sure. Serve it with a green salad. 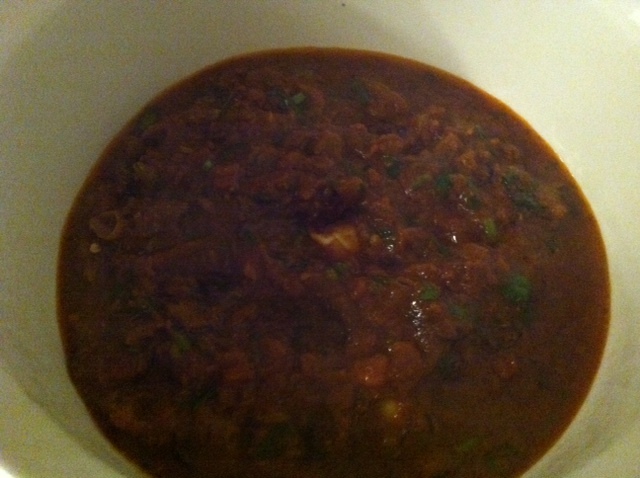 Under medium heat, in a pot add the olive oil and once warn add the ground beef or turkey. Brown it well, then add the cabbage and let it wilt. 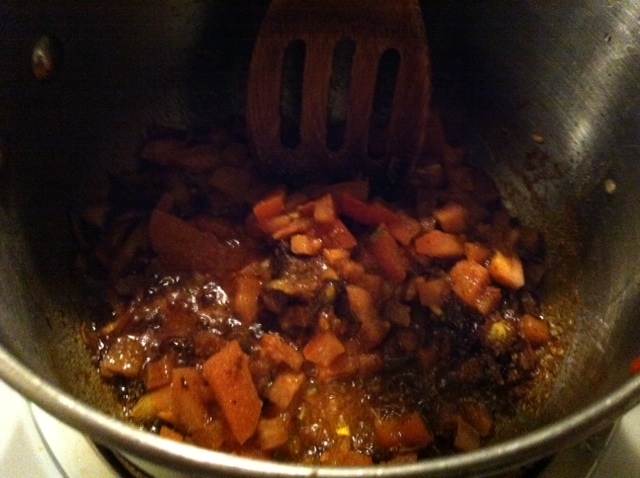 Add the spices–ground cinnamon, pepper, salt–and let cook for another 2 minutes. Add the rice, enough water to cover it entirely and leave under low heat until the rice is cooked, and the water has evaporated entirely. Serve hot, with a salad. 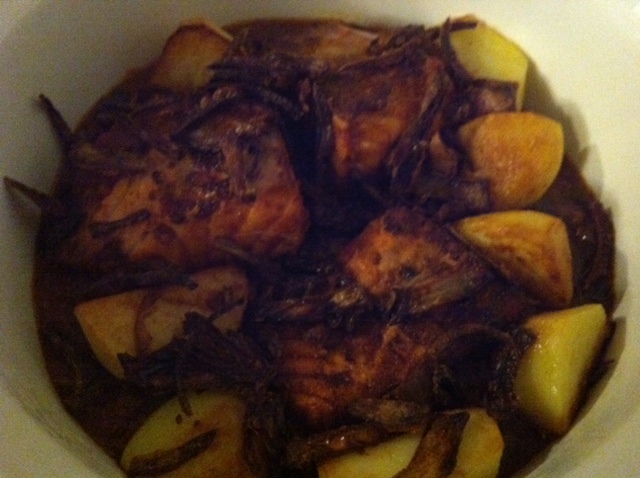 I made another Mandee today, but this time with chicken. We’re just two people as I mentioned, and since I cook everyday I only make what we eat on a particular day. I don’t like having any leftovers, so my quantities are measured. So, you can double, triple or quadruple according to the number of members in your family. 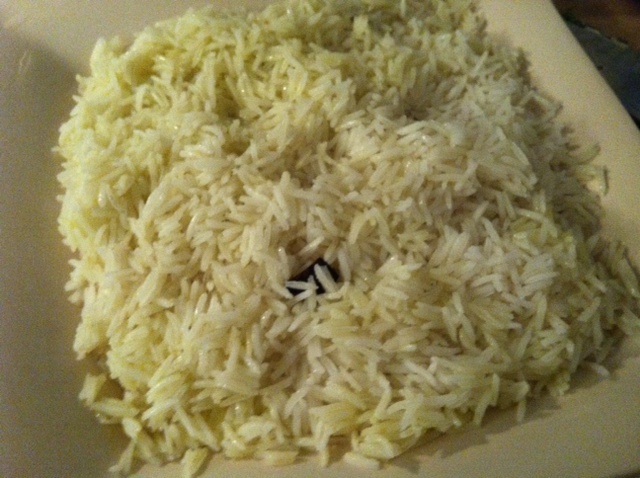 I usually measure 1/2 cup of rice per person, if you are not serving anything else. Otherwise it is 1/4 cup of rice per person. 1) Half of a whole chicken–literally cut in half and leave the skin on. Or you can use a whole Cornish hen. 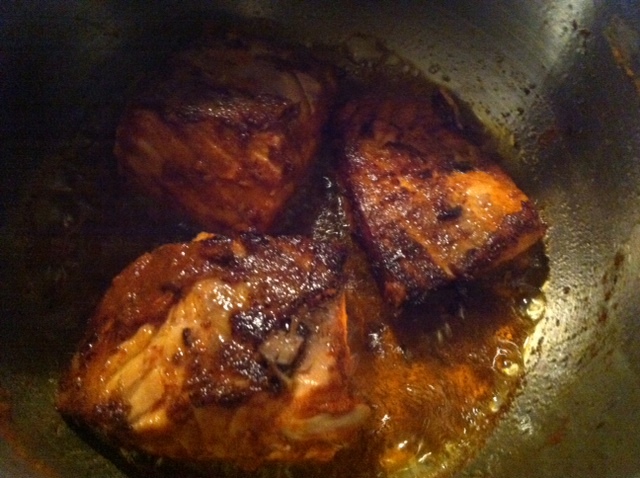 Marinate the chicken–it turns out better if you do it the day before–but you can also marinate it on the same day. 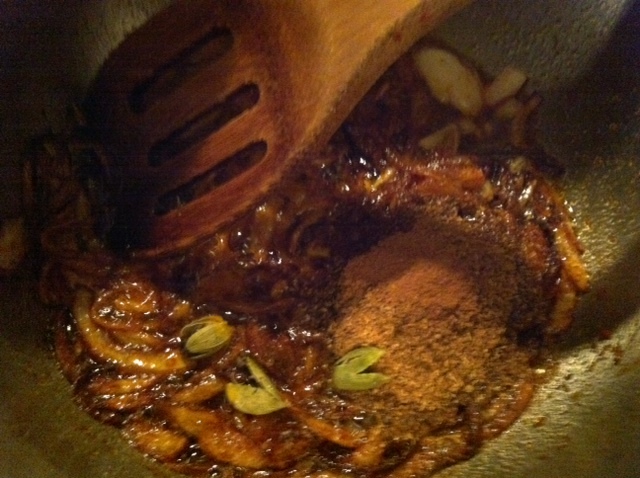 Use half of the oilive oil, cumin, coriander, black pepper, and cinnamon powder. All of the tumeric. Add salt. 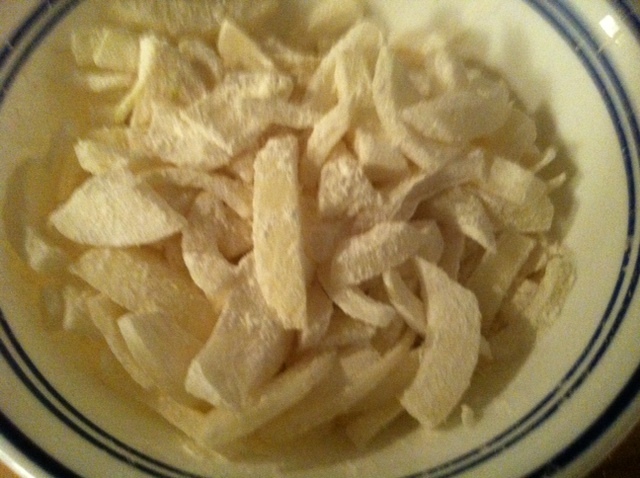 Cover every nook and cranny of the chicken with this mixture. 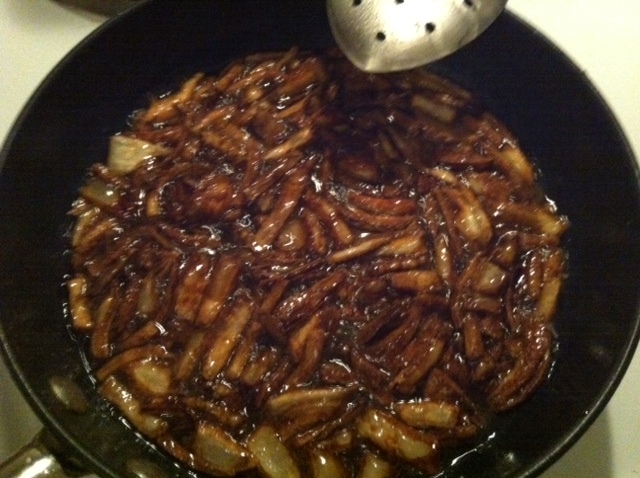 Place a pot on medium heat, and add half of the oil, onions and half of the cumin and enough salt for the rice. When the onions starts to turn a golden brown add the green hot pepper, dried lemons, rice, half of the coriander, black pepper, cinnamon powder, cardoamon,cinnamon stick, and pepper corns. 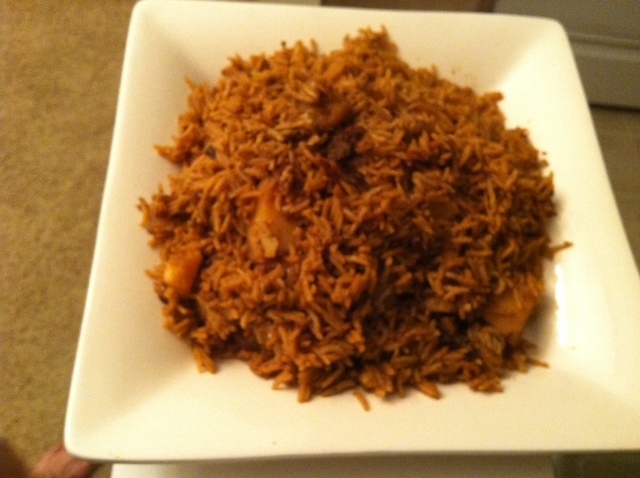 Mix well and let the spice mix with the rice by stirring for about 2 minutes. 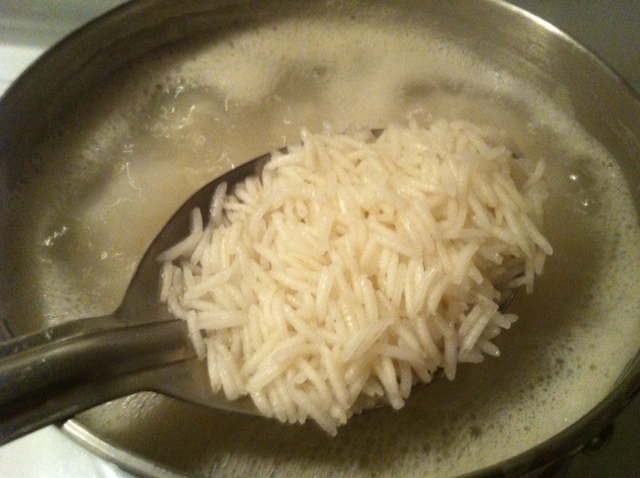 Add hot water (2 cups) to the rice. Take a piece of foil and fold once and cover the mouth of the pot tightly. With a fork pierce the foil randomly. 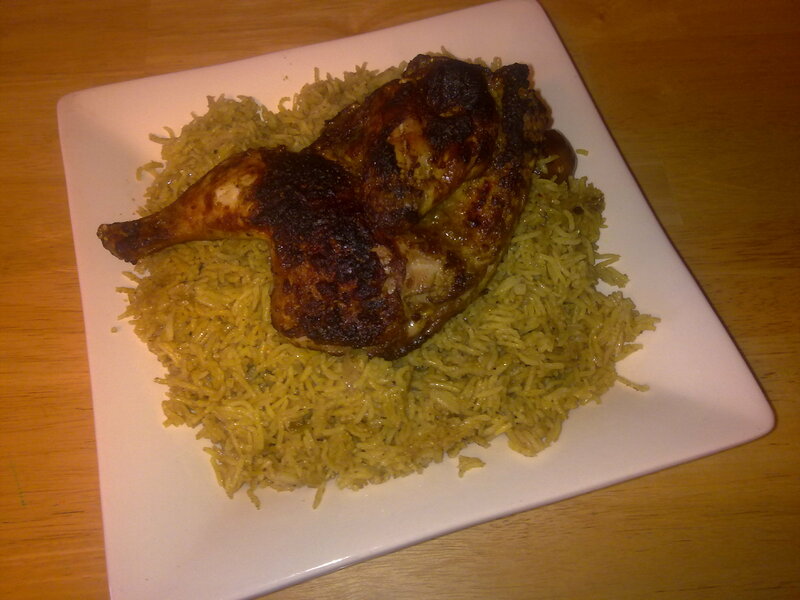 Place the spiced chicken on the pierced foil. Then take another piece of foil and cover the chicken. Make sure you cover it well so no steam escapes. 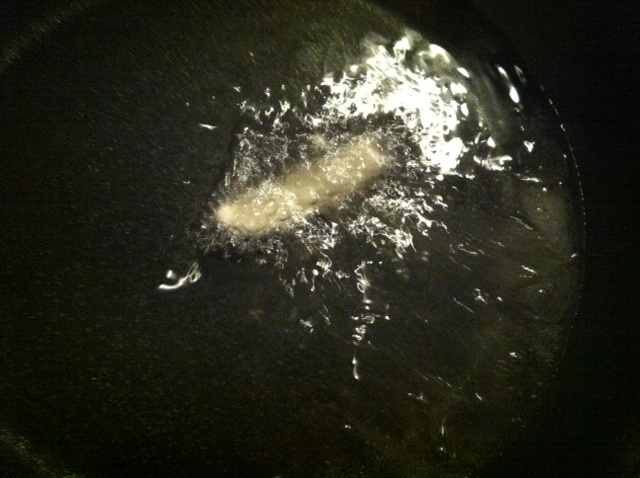 Leave on very very very low heat–one you can hardly see– for about 45 min-1 hr. After half an hour take the foil off and place the chicken under the broiler to brown, and finish cooking if it hasn’t already. 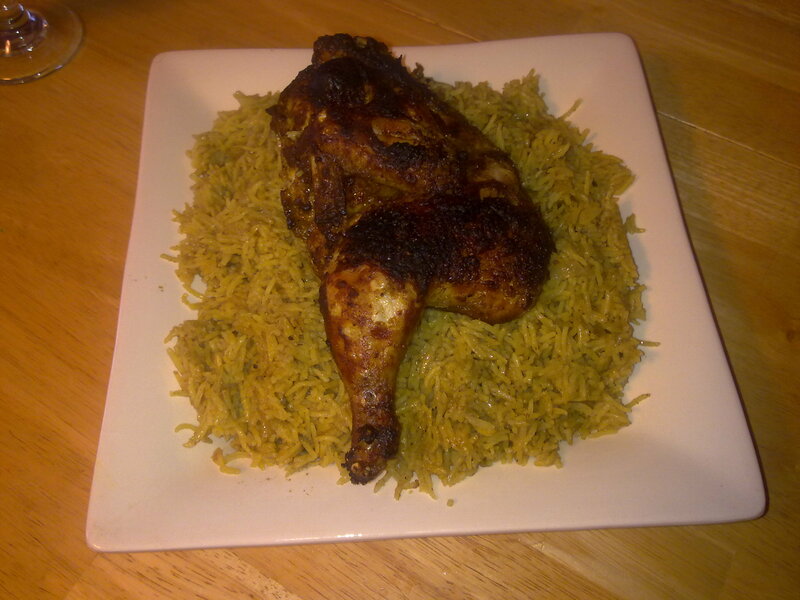 To serve, place the rice on a platter and arrange the chicken on top. Serve hot. Goes well with a green salad.